When many people think of symbolism they think about how animals can relate to people. For example, mother bears are just as protective as human mothers. However, it’s not just animals that can be symbolized. Plants and even ideas can have their own symbolism! This article will discuss some general symbolism about trees, and then go on to talk about the symbolism of some specific types of trees. All the parts of the tree are important to the plant’s symbolic meaning. The roots, trunk, branches, leaves, and sometimes fruit are all important physical and symbolic parts of the tree. All of these parts of the tree add a certain amount of symbolism to the plant. All trees have this basic symbolism in them, but they have a little added on as well. The roots of a tree can represent how a person can be rooted in one spot. Trees rarely move from where they are originally planted. If they are moved, then it is because a human moved them. The tree is content in it’s place in the world, even if the humans around it isn’t. The trunk of the tree can symbolize all of the strength that lies within the tree. The trunk needs to be able to hold up the weight of the tree if the plant is to survive. Another important part of the tree is the plant’s branches. The branches of the tree often symbolize family and home. Many animals make their homes in the branches of trees; bird often build their nests in the high branches to stay away from predators. The branches also can symbolize family because of the way that humans draw out family trees. Family trees branch off into different directions, just like the physical trees. Leaves and needles are also important. Trees with leaves can symbolize the circle of life and death rather well because of how the tree loses its leaves in the winter and grows them back in the spring. Trees with needles somewhat represent eternal life or, at least, persistence. They don’t lose their needles just because of the changing of the seasons. This can also help to symbolize the strength of the tree. Lastly, the fruit that sometimes grows on trees can represent new life and closeness to nature. Subsistence is what we can get from these fruits, and it is also what can be symbolized by these foods as well. Apple Trees can provide their own symbolism as well. The apple tree is a wonderful tree in many regards. It is great at producing fruit in many of the seasons, depending on what kind of apple tree it is. The apple tree is said to be related to the female form and everything feminine. Because of this fact, the apple tree is great at symbolizing motherhood, fertility, romance, and beauty. Willow Trees also have important individual symbolism. Centuries ago the willow tree was used in many pagan, as in non-Christian, ceremonies. These ceremonies were often held at night, relating the tree with night. Because of all of these things, the willow tree symbols night, imagination, and mystery. Many other trees have their own special meanings to them, these are just a couple of good examples of how different two types of trees can be symbolized. 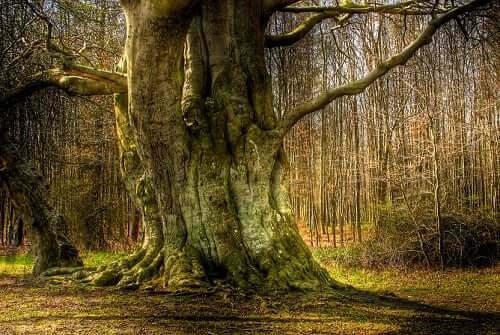 Trees are symbolized together well, but they have their own unique symbolism that add to their interpretation. Many other plants share this type of symbolism. If you want to learn more about plant, animal, or other symbolism then you can read more articles like this one here on SunSigns.Org!